FOREST GROVE—McNary continued to lean on its running game, racking up 246 yards, as the Celtics defeated Forest Grove 35-14 on Friday, Sept. 29. McNary had two runners go over 100 yards as sophomore Junior Walling gained 107 yards on 21 carries and senior Freddy Jimna had 101 yards on 12 attempts. “I just want to thank my O-line because they worked hard all this week, getting the plays right and figuring out which linebackers to block so I could find a hole,” Jimna said. The Celtics were without senior Lucas Garvey, who broke his collarbone the week before at McKay. But simplifying the offense didn’t cure all of the Celtics problems. Three interceptions, negative plays and penalties allowed Forest Grove to remain in the game into the fourth quarter. McNary scored its first touchdown on a 2-yard run by Jose Solorio to give the Celtics a 6-0 lead with 2:40 remaining in the first quarter after the extra point was blocked. 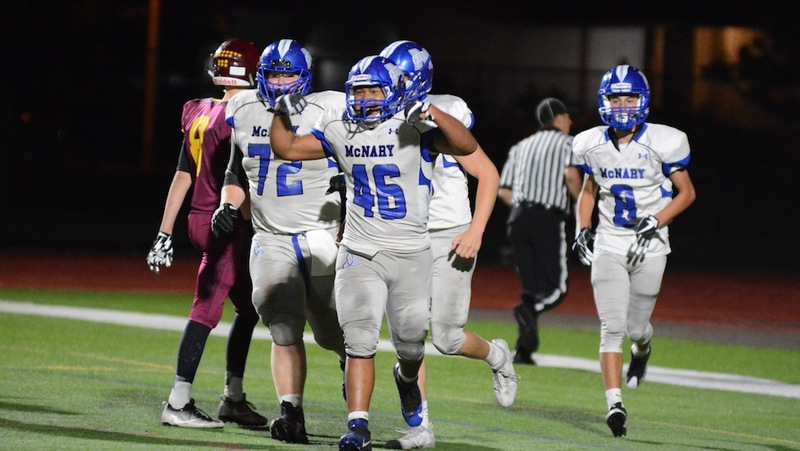 McNary’s defense then got its first turnover when junior Devyn Schurr intercepted Forest Grove quarterback Jarod Miller, giving the Celtics the ball at the Forest Grove 36-yard line. After two incomplete passes and a sack, Alan Jefferson was able to punt the Vikings inside their own 2-yard line and Walling tackled Forest Grove running back Kurtis Van Dyke in the end zone for a safety. Barker was then intercepted throwing a jump ball to Jefferson with 10:10 remaining in the first half. However, Solorio picked off Miller on the next play to give the ball right back to the Celtics. McNary had the ball at the Forest Grove 11-yard line but an unsportsmanlike penalty led to a fourth-and-long and missed 31-yard field goal. The Vikings again gave the ball right back to the Celtics as Schurr recovered a fumble. Barker made Forest Grove pay for this one, connecting with Jacob Jackson for a 36-yard touchdown, and McNary led 15-0 with 6:49 remaining in the second quarter. The Vikings were held to zero yards on their first 11 plays until Miller completed a 23-yard pass to get Forest Grove into Celtic territory late in the first half. Miller added an 18-yard pass and a defensive pass interference penalty got the Vikings inside McNary’s 10-yard line. Forest Grove running back Cole Smith then fought his way into the end zone to get the Vikings within 15-7 at halftime. With 3:07 remaining in the third quarter, McNary went back up by two touchdowns as Walling capped off an eight-play, 78-yard drive with a 9-yard touchdown run. The Celtics defense then forced another three-and-out. But Barker, trying to avoid a sack, threw an interception, which the Vikings returned for a touchdown to get within 22-14 with 1:05 left to play. Barker was then intercepted for a third time with 47 seconds remaining as a Forest Grove defender ripped the ball away from Griffin Oliveira. But McNary’s defense again held strong, forcing another punt. On fourth-and-3, Walling got loose for a 21-yard touchdown run to stretch McNary’s lead to 29-14 with 7:07 remaining in the game. Jimna put the final nails in the coffin, recovering a fumble on defense and then adding a 16-yard touchdown run with just 2:42 left to play. “We were running to the wide side, I just saw that skinny corner and thought I could intimidate him with my size and he wasn’t able to tackle me,” Jimna said of the touchdown. After the game, McNary’s coaches weren’t satisfied with the win. Claggett Creek shut out Waldo 30-0 on Wednesday, Sept. 20 in its home opener to begin the season 2-0. Quarterback Nathan Allen and receiver Evan Cornell connected for two touchdowns in the rout. Aron Montoya and Rudy Garcia both had rushing touchdowns. The Panthers defense has yet to allow a touchdown this season. The head official, a longtime 6A head referee, commented after the game that he couldn’t remember a harder fought youth football game with better sportsmanship from the players, coaches, and fans on both sides. After falling behind 12-0 early, Whiteaker clawed back to lead 14-12 at half. Judson retook the lead 18-14 early in the fourth, and was driving to put the game away, but a fourth down sack by blitzing outside linebacker Carson Long gave Whiteaker the ball with 1:30 left and a chance to win. The Wolverines drove into Judson territory and had their chance when receiver Grant Goesch ran open past the Judson secondary, but pressure on quarterback Porter Vaughn prevented him from throwing the winning deep ball. 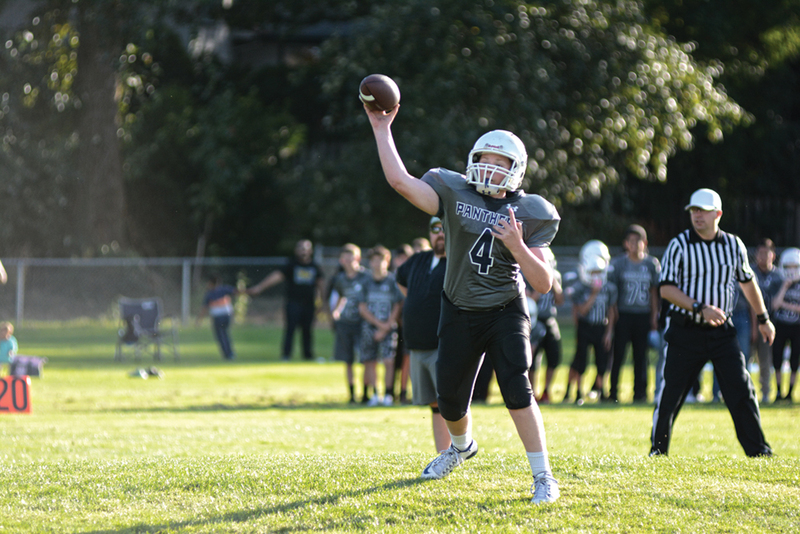 Despite heavy pressure, Vaughn threw for 178 yards (0 interceptions) and a touchdown to Long, who led the team with eight receptions. Whitaker also ran the ball well, with Axel Zapien, Bo Bielby and Felipe Hernandez combining for over 4.5 yards per carry. Whiteaker’s defense was a solid team effort; leading tackler, Long, had seven stops, but six other players (McGrath, Vaughn, Millis, Wyatt Paul and Jared Garibay) each had at least four.